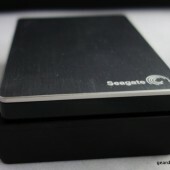 The other day we took a look at a massive 4TB Seagate portable hard drive. That’s a tremendous amount of mobile storage capacity, and it’s possibly overkill for many. 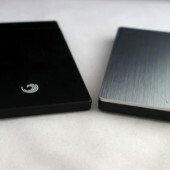 Today we’re taking a look at a far thinner drive, the Seagate Backup Plus Slim Portable Drive. 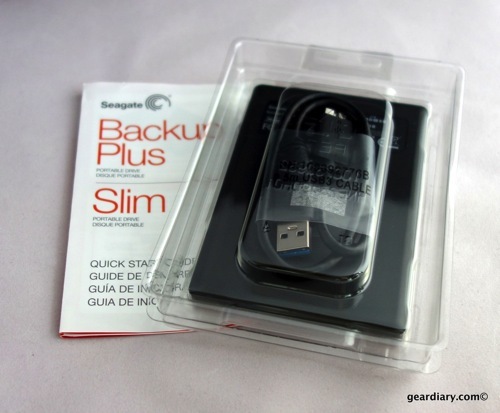 It’s slimmer, but it still offers plenty of storage – 2TB to be exact. 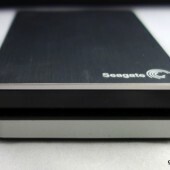 With this drive we get back to the size and weight we are accustomed to from Seagate’s 2.5 inch mechanical drive portable storage devices. 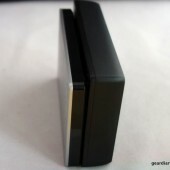 This is a thin drive that is also quite light and is simple to use. It is perfect if you want something to throw into a gear bag or slip into a pocket and bring with you. 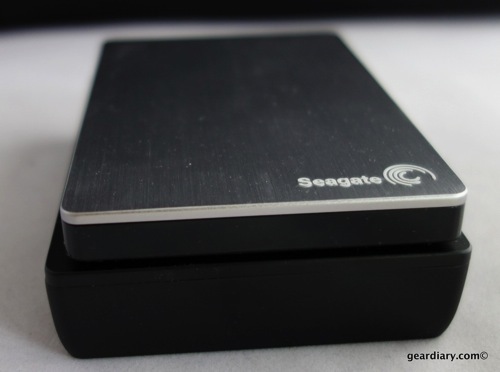 Like its new 4TB sibling, this drive has a USB 3.0 interface that is backward-compatible to USB 2.0. There’s no Thunderbolt connectivity available here, but the USB 3.0 Connection should be plenty fast enough for most on the go use. Back Up Your Stuff—Anytime, Anywhere: The Seagate Backup Plus Slim Portable Drive is the simple, one-click way to protect and share your entire digital life. Perfect to take on the go, the sleek metal case design allows for the thinnest portable hard drive available with up to 2TB of capacity. It goes anywhere — without getting in your way. As one Gear Diary reader pointed out, this drive is a single unit and, as such, probably isn’t ideal for archiving files you want to protect. A single drive failure and you are completely out of business, and that’s not a risk I would want to take with my precious files. Then again, this is a portable drive and anything you carry with you runs the risk of being lost or stolen, so I don’t see this as an archival drive regardless. 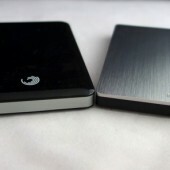 This drive — the smaller one on the top — has “just “2TB” of storage, while the larger capacity device under it has a massive 4TB. Fact is, with 2TB of storage, there’s plenty of space on this drive for all of your files. To put it into perspective, this drive has four times the capacity of my 500GB SSD MacBook Pro retina. That means I can, and do, use this as my Time Machine backup, and I can use it to store all of the files I don’t want taking up space on the laptop. Of course, if I want to archive those files on something that is safe and redundant just in case my drive fails, is lost or stolen, then I’d use a different drive for that. The great news is that, once I dump my infrequently-used files onto this drive I can free up a huge amount of the space that is currently in use on my laptop. That’s a good thing since I tend to run with just about 50GB of free space on any given day and, not-infrequently, see it drop down to just 5GB. When you are working with video files that’s not really enough. 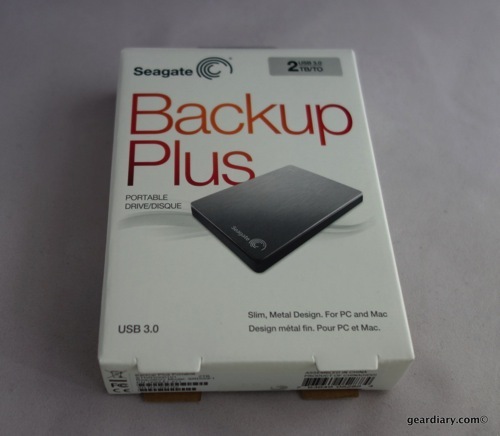 The Seagate backup desktop software is quite useful if you want to quickly and easily archive files from your portable device. 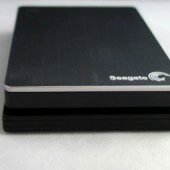 And the Seagate transfer software allows you to quickly and easily sync files over to the drive as well. That means I can have a Time Machine backup on the drive and sink all of my active files to the drive for safekeeping. Not to beat a dead horse, but if you have the drive and the laptop in the same bag and it’s stolen, then you’ll be out of luck. 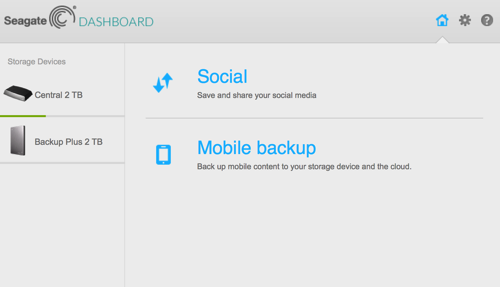 Use the Seagate Mobile Backup App to easily back up photos and videos on the go directly from your mobile devices to Backup Plus Slim Portable Drive. 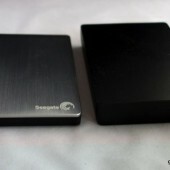 Here’s a size comparison between this drive and some of the other Seagate drives we have reviewed. The Seagate Backup Plus Slim Portable Drive is a great, small, slim drive that lets you toss 2TB of data into your pocket. Honestly it totally boggles my mind that this tiny drive has a capacity so huge. When I put it up next to drives of similar size that have just 320GB to 500GB of space, AND I realize that I was amazed by them at the time, AND I realize that was less than a year ago, I am especially amazed. In a world of space-challenged solid state computers this drive promises to be your computer’s new best friend. 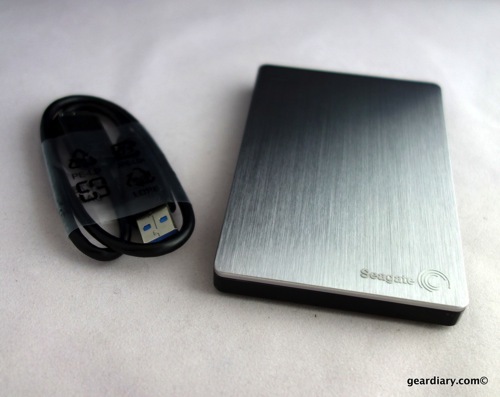 The Seagate Backup Plus Slim Portable Drive is available in 500GB, 1TB and 2TB capacities. Learn more here. Having a father who was heavily involved in early laser and fiber-optical research, Dan grew up surrounded by technology and gadgets. Dan’s father brought home one of the very first video games when he was young and Dan remembers seeing a “pre-release” touchtone phone. (When he asked his father what the “#” and “*” buttons were his dad said, “Some day, far in the future, we’ll have some use for them.”) Technology seemed to be in Dan’s blood but at some point he took a different path and ended up in the clergy. His passion for technology and gadgets never left him. Dan is married to Raina Goldberg who is also an avid user of Apple products. They live in New Jersey with their golden doodle Nava. Mobile World Congress didn’t disappoint this year; there were so many new smartphones shown, and that’s where the LG G8 ThinQ made its debut. Loaded with tech, the G8 ThinQ is a compact communication device with fantastic sound, better than average cameras, a gorgeous screen, and minimalistic design.